It is Fall, and here in RI that means it is the best time of year for cool season grasses. My lawn looks great from March to November, but now it is also free of weeds. As a master gardener, I am very tuned in to lawn care practices and I am frequently asked what makes my lawn so healthy. When I explain that one of the most important things is not fertilizing four times a year most people are shocked. Yes, besides doing regular soil testing and using mostly fescue grasses, I fertilize only in the fall (around mid September) and then again in late March, every other year. 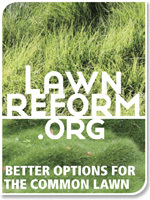 Too much fertilizer – that means four applications every year (as recommended by major lawn care companies) – is a waste of money and is harmful to the environment, as well. You see, grass only uses a limited amount of fertilizer and the rest goes into runoff that pollutes our water. Fertilizing grass in summer when grass is dormant just stresses the grass. Excess fertilizer also means too much nitrogen, which is converted to nitrous oxide and destroys the ozone layer. So remember, the grass is greener in Fall but only if you stop applying fertilizer four times a year and follow other good lawn management practices. This entry was posted in Uncategorized and tagged Lawns. Bookmark the permalink.